After several months of planning and anticipation the annual CANYONLANDS MOTOR CLASSIC event in Moab was upon us, sponsored by Fred at Arrowhead Motor Sports in Moab, Utah. Fred is one of the largest KLR after market suppliers in the US and he knows a few of the Saffers that order from him on a regular basis. One hell of a nice guy that believes in treating customers with respect and the highest level of service. Here is his website http://www.angelfire.com/ut/moab/parts_frames.html. Talk about a kid in a candy store. Imagine walking around in a warehouse with just KLR parts. From the smallest to the largest thing you can think off. I walked away after investing in a ProTaper ATV SE High set of handlebars to make standing on the bike easier. Unfortunately Eagle Mike that makes the balancer levers for the KLR had to bail out at the last minute. I am a forum moderator over at KLR World.com and we had about 25 members join us, some from as far as Pennsylvania and New York which is a good 2,000 miles away. Some other KLR regulars also showed up and I would not be surprised if we had about 40-50 KLR's there with a few BMW's and KTM's for good measure. I finally got to meet the legendary (at least here in the US) Patman from Patman Racing. This dude used to desert race and although he brought up the rear most of the time, he would seize the moments when we all stopped to turn around a few miles and then come blasting through the desert at 80 MPH. Obviously, his bike is bullet proof with the 705 upgrade and a heavy duty suspension. It was beautiful to see him in action. 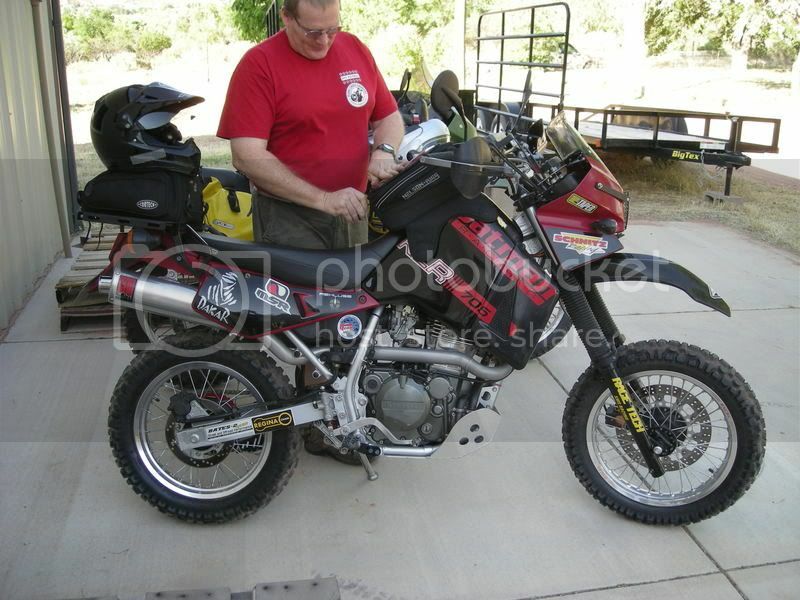 Check out his monster KLR 705 with Recluse Auto Clutch and a KX 500 rear rim and tire on the front. He calls it his skid and say the tire just blasts through anything you can throw at it. Once he gets the other edited I will post them up. He followed each of us and filmed us in action, pretty cool stuff. Anyway, here are some pictures and I will try and comment as I go. - The geology starts changing seriously just before I exit Arizona and drive into Utah. This is fairly close to the Grand Canyon. The next set of pictures is from Monument Valley in Utah. The area is entirely within the Navajo Indian Reservation on the Utah/Arizona border; the state line passes through the most famous landmarks, which are concentrated around the border near the small settlement of Goulding. Moab has many trails to explore and it is known as a haven for 4x4's, rock-crawling and bicycle riding, not to mention DS riding. Saw literally hundreds of DS bikes. The KLRistas made up the majority but there where also groups of BMW and KTM riders. We crossed paths with a dude on a Tiger on the White Rim trail (WRT). No helmet, shorts and takkies and off he went. Not a good idea in the dessert! The Canyon lands preserves a colourful landscape eroded into countless canyons, mesas and buttes by the Colorado River and its tributaries. The WRT follows along the canyons. The rest of the pictures were all taken on the WRT. The first two pictures shows a spot we had to navigate that had powdered earth about a foot or two deep . A few riders went down here and the one picture shows BigJohn with a puncture wound to his leg after the steel foot peg penetrated his leg. Sgt Marty had a first aid kit and was burning to try it out. He was however unable to convince John that he would just stitch him up right there. The guys did a great job and cleaned up the wound. John rode the rest of the trail (about 70 miles), standing on the foot pegs without complaining once. John is retired and in his sixties . They just don't make them like that any more ! The guy with the black and red armor vest tending to John was an interesting guy. He served in the US army and was stationed in Pretoria for a few months. The last picture was at Arrowhead Motor sports. If you want to see more, the guys are posting them up over at KLRWorld.com here. Hope you liked them ! Wow,what an awesome experience Thanks GM! 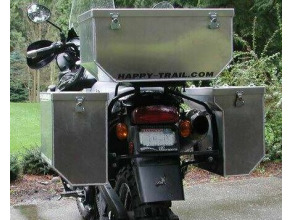 Here is one lesson learned for all KLR owners. Inspect your foot peg bolts often and make sure they are tight. Locktite is your friend ! I think if you haven't been in the States then it must actually be difficult to comprehend how vast it is. There must be awesome places to ride and so much to see. It looks like you guys have some good comaraderie with the DS fraternity. I really enjoyed your ride report and the pics. Sometimes I just can't help thinking of "Always bigger and Better in America". The pics..... My favorite kind of terain. Man that is stunning!!!! Well done GM! I'm still trying to figure out a word to describe that KLR 705......!!!!! I'm in love!!!!!!! What an awesome place to ride!!! Thanx GM. Enjoyed your report. I want to go to Moab!!!!! You say your a$$ is not ready for a few 100 miles? With that thingy over your seat, you would barely feel it. Another thing, please get some proper hand guards, those paddles are ugly. Amazing scenery. Words fail me. Thank you! I am working on the scoops. Just put on a ProTaper ATV High set of bars. The bark busters are next.